Not that we can rest on our laurels in an evolving market, continuous effort is required to ensure that we stay ahead of the game, providing greater effectiveness and offering the highest quality. 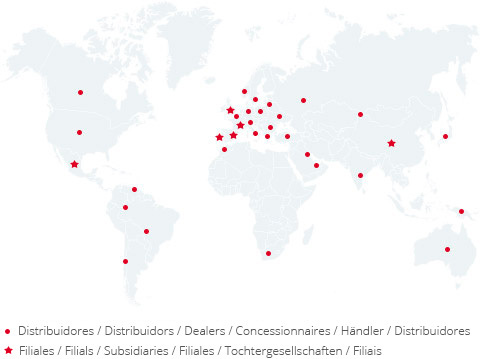 The company’s entrepreneurial spirit and strategy of international expansion have resulted in Salicru today being present in more than 50 countries to ensure that customers are provided with high quality power supplies. The company has subsidiaries in France, Portugal, United Kingdom, Hungary, China and Mexico, and sales offices throughout Spain. The supply of the more than 700,000 Salicru products currently in operation around the world to address innumerable professional challenges has enabled the company to acquire the experience and knowledge to ensure that we can provide solutions ranging from consulting and engineering to manufacturing and management. Salicru’s professionalism has been recognised by large companies of the likes of Abertis, Kuwait Oil Company, Alstom, Banc Sabadell, Bank of China, BBVA, Bouygues, Boehringer Ingelheim, AENA, Caixa Bank, Cepsa, Credit Lyonnais, Cisco and Dow.